My husband Brian and I travelled to Thailand on the 24/02/2014 for a 2 weeks backpacking holiday, that would start in Bangkok and on to Chiang Mai, Phuket and Ko Phi Phi and then back again to Bangkok for a day before our flight home. This was our first ever backpacking holiday and also our first time in Asia (my chance to start dusting off my backpack). Our flight was with EVA airline and it was a direct flight from London Gatwick to Bangkok ( a breakdown of our holiday costs will be at later post). We arrived in Bangkok in the afternoon on 25/01/14. This was our first time flying with EVA and would certainly do so again, we found the flight to be very comfortable with good leg room and the cabin crew were very friendly and efficient . From the airport it was easy to get a taxi to our hotel, although we lost few minutes trying to find our hotel name and address since the people that organise a taxi for you, did not know just by giving the name of our hotel where it was located. So it is a good idea to have this information in your hand as you queue for the taxi. There are many other options to get to your hotel, train, bus or some of the more expensive hotels often can arrange for a pick up car to collect you. We immediately loved our hotel ( Riva Surya), the reception staff were great and we were given a cold drink (some sort of sweet tea), whilst doing the necessary checking in papers. Our hotel room was great and had lovely views of the Chao Phraya River (see above picture from our room ). After unpacking we decided to go out and explore a little, so went for a walk to Khao San Road which was not far from our hotel. This road is famous as the backpackers hub. It is lively, lots of food stalls (selling delicious and cheap street food) also selling some unusual things such as deep fried insects, scorpions etc. I decided to try the deep fried scorpion. Not exactly my kind of snack, very crunchy and salty, a little hairy in places. This chap next to me was just another traveller, who got caught in the excitement of trying something so bizarre and asked to have his picture taken with me. We learned during this trip that starting a conversation, sharing drinks and food with total strangers becomes so natural, you don’t even question. It was such a lively vibe there, backpackers arriving and looking out for a hostel to spend the night in, bars serving exotic drinks, colourful lanterns, acoustic guitar players singing live in some of the cool bars, tuk-tuks and mopeds transporting people, sometimes whole families on one moped. Hard to believe that just hours earlier we were battling the floods in England and now we were in such exotic country, experiencing sounds, smells and a culture so different from ours. Yet we sat in a bar having a drink and realised the football game on the TV screen was Bournemouth v’s Liverpool, it made as laugh, so far from home and yet, there it was a live game with pictures of our home town. It was fascinating to just sit back with a drink and watch people from all over the world congregating and mixing into this cosmopolitan road, a meeting point for travellers. Our first full day in Bangkok, so got up at 9 am a little jet lagged and decided that we would have our breakfast in a more authentic Thai place than our hotel. So we decided to learn how to use the river as a way of getting to our destination and avoid the famous busy traffic, which we were told was even worse since the riots started. 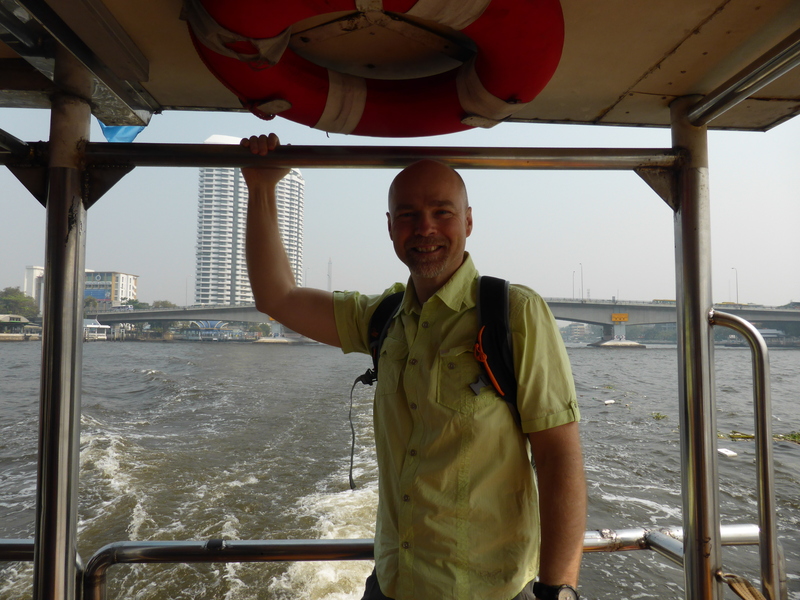 We got on a boat (from the pier right in front of our hotel) to visit the Grand Palace. You can buy a one day boat ticket and use it to go up and down the river as many time as you want throughout the day. Brian below enjoying the ride and river views. We arrived at the pier for the Grand Palace and bought our breakfast from one of the stalls in the little market, a lovely sticky rice and mango ( the rice is sweet and is perfectly complimented with the sweet juicy mango slices). Be very aware of SCAMS here, we almost got scammed, at a quiet entrance to the grounds of the Grand Palace an official looking Thai man told us the Palace was closed in the morning, so we should go on his friend’s tuk tuk to see other sights first and come back later in the afternoon. We even went inside the tuk tuk, when we realised it was a scam to take us to various shops (the word fashion started us thinking ) and try to sell things, apparently a very common scam. We realised it in time and got out of the rogue tuk tuk and headed towards the main entrance, where we managed to get into the Grand Palace with no further problems. Since it is a holy site, you have to wear appropriate clothing, cover shoulders and wear longer skirts or trousers, but if you are not wearing the right clothes, you can borrow clothes there (right by the main entrance). 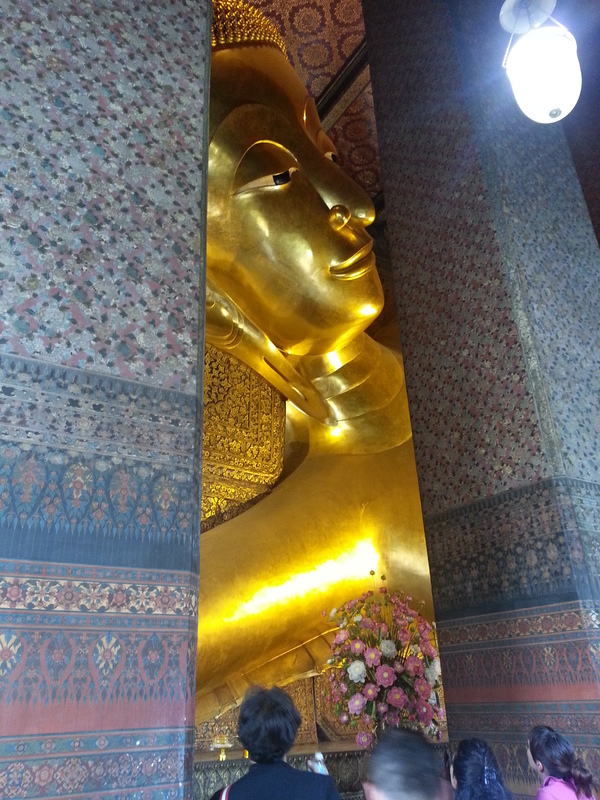 The Grand Palace ( former residence of the Thai King), is indeed very grand, we wandered around in awe, so beautiful. Intricate work of tiny colourful, gold and glass mosaics covering these incredible buildings, and creatures. Lots of gold Buddha figures. 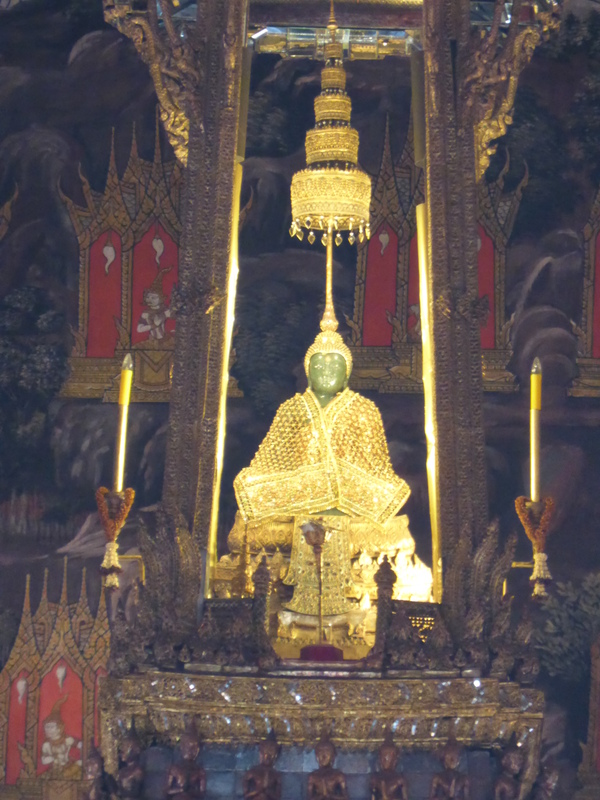 We also visited the Royal Monastery of the Emerald Buddha (see below). He is dressed in different clothes, depending on the season, this time he was wearing his winter clothes. 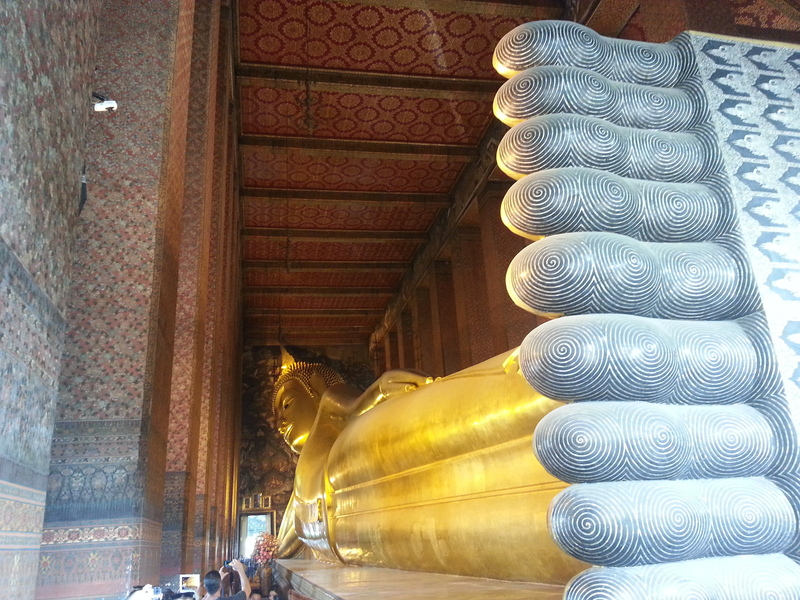 After lunch (more delicious street food), we visited Wat Pho, the largest reclining Buddha and the largest collection of Buddha images in Thailand. It was very busy there and it felt a little bit rushed as we struggled to take pictures, before having to move on, like a big conveyor belt. 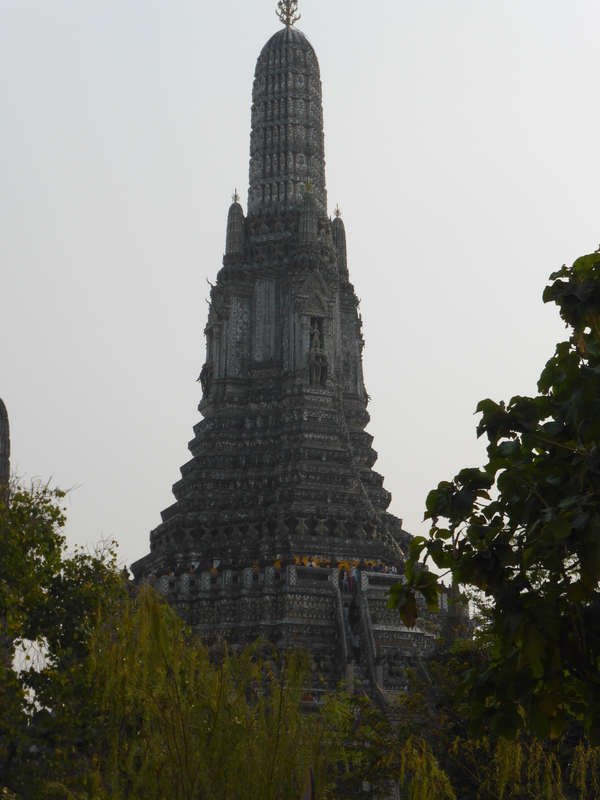 From Wat Pho we took a ferry across to Wat Arun, which is in the opposite side of the river. Also know as the Temple of Dawn. This amazing temple is covered in ornate floral mosaics made from Chinese porcelain. 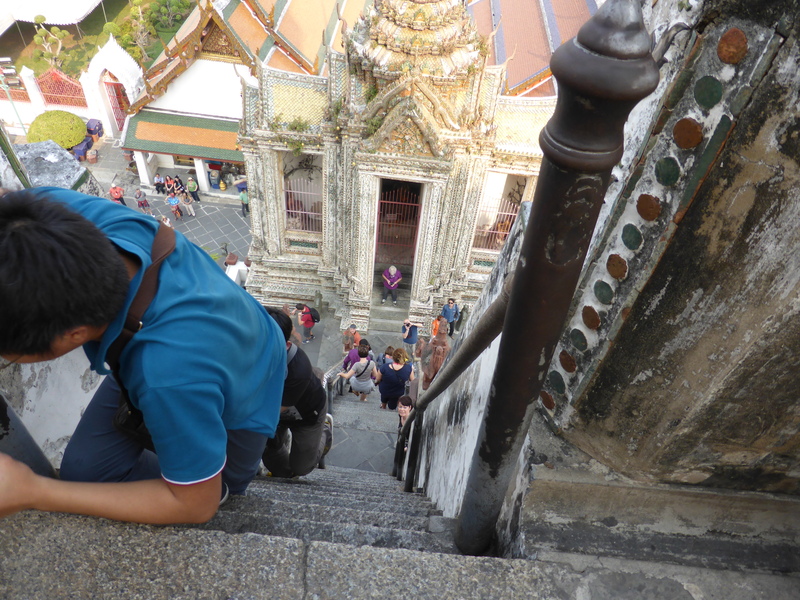 We climbed the VERY steep and perilous steps to the very top, holding on the the rope at the side for dear life, but once at the top, the views of the river and temples across the river are worth the hard work. Templed out and keen to get back to our hotel for a rest, we started making our way back, but we were not very sure of what the appropriate boat to take, and ended up on board the Chao Praya Express, going down river, in the opposite direction ,which left us in the “Aquatic Pier” in very modern Bangkok. Eventually we found the right ferry boat going to pier number 13 (our pier), and got back to our hotel for a rest and refreshments before venturing out again in the evening. We left our hotel at about 7 pm to visit Chinatown, already feeling hungry and keen to try some more of the local food. We got into our first tuk tuk, an experience that I fully recommend ( although maybe not the safest modes of transport) it is certainly very exciting, since you feel the warm air all around you, you experience the roads, the smell’s, the pollution and the sights in a much more intense way ( it is difficult to describe how it gives you such a sense of fun). The tuk tuk drivers are also experts at navigating the busy roads, we felt like we were in a set of the Indiana Jones film, zipping across Bangkok, with the wind in our faces and the chaos of the traffic all around us. 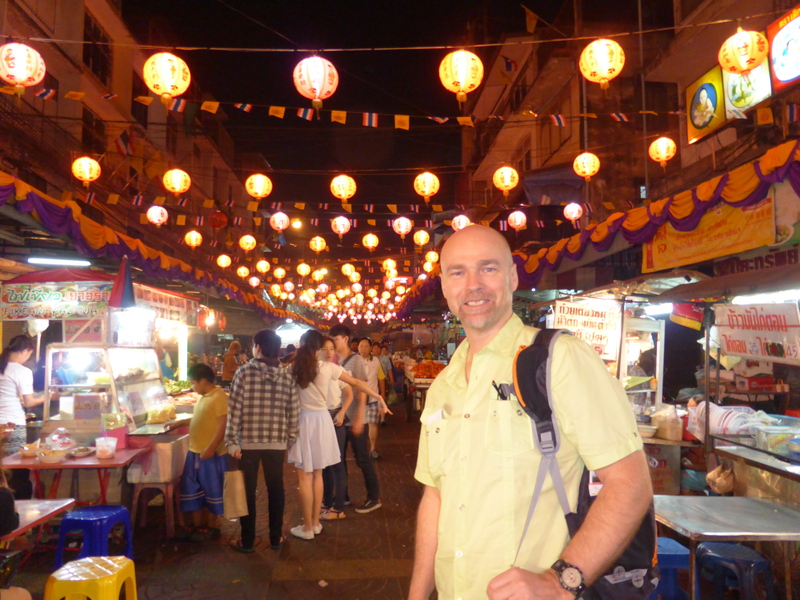 I have visited many Chinatown’s before in places such as London, New York, Birmingham and Liverpool, but Chinatown in Bangkok is not like any other Chinatown, you have to see it to believe it. It was all decorated for Chinese New Year celebrations, with colourful lanterns and banners. Incredible smells of food, sizzling in the woks of the street food stalls. We ordered fried rice and prawns, Thai chicken curry and a drink each (so cheap). It was delicious and felt amazing to be there and experience it all, it felt surreal and magical. We got lost exploring the tiny alleyways and market stalls, selling the unusual, the good and the ugly. We were both in love with Bangkok. We finished the evening back at our hotel, sitting out in comfortable sofas in their decked pool area, for a drink and ice cream, enjoying the night river views and warm air, this hotel was the most expensive one we stayed in, but we felt like splashing out a little at the beginning of our adventure. In the morning we decided to do a river tour and Brian and I hired a long tail boat ( 1,000 Baht) for about 2 hours, and he took us all around the little canal’s (Bangkok is also known as the Venice of Asia), passing Thai homes, perched at the side of the canal’s, displaying shrines to Buddha, we watched how they go about their everyday lives along the river, washing their clothes, feeding their babies. 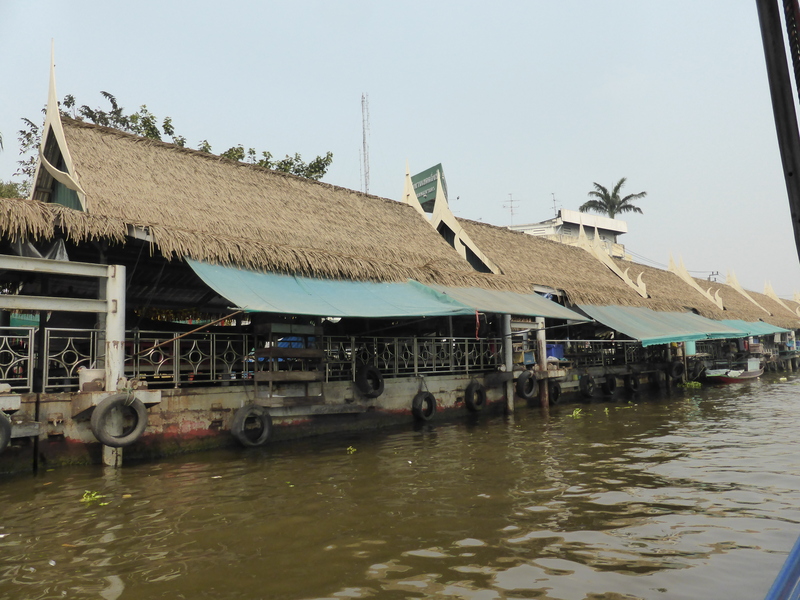 We passed the Royal Barges National Museum, Wat Arun and other river side temples. We felt it was a relaxing and very enjoyable tour, and so different to see the sights from the water. Back at our hotel pier, we boarded again the Chao Phraya Express from pier 13 to Central Pier and on to the BTS (sky train) to National Stadium (Sky train stop for the MBK ). We wanted to check out this big shopping mall and also to have lunch at the large food court. Brian bought a Thai SIM card here for his phone, something that proved to be very useful during our stay in Thailand. We saw some of the demonstrators, their tents and beds, just outside the MBK shopping centre area, they were peaceful and we did not feel at all threatened or scared. At the end of our 3rd day in Bangkok we left our lovely hotel and headed for the train station, where we boarded the 7:30 pm sleeper train to Chiang Mai in the North of Thailand, for the next part of our adventure. Stay tuned to for the next blog post. 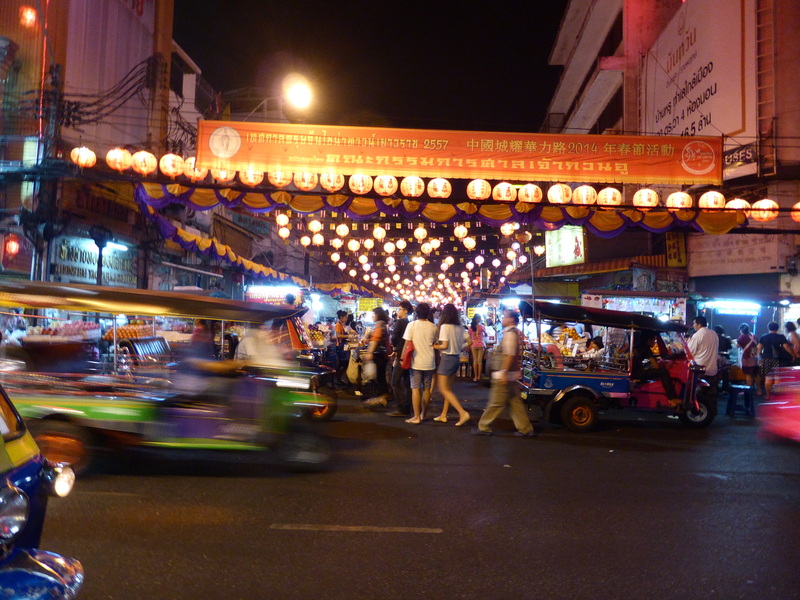 You’ve just made me nostalgic for Thailand, one of my favourite countries! It’s great to hear about what your first impressions were and see the country afresh through your eyes. It sounds like you had a great, memorable trip. Hi Amy, thank you for your comment. We fell in love with Thailand and want to go back and explore more. I have been following your blog from when you set off and loved all your posts about Thailand, they were a good source of information for me.